Get in touch with nature at Seven Fells Up and Elan Ski Shop & Rental. You'll explore the less-touristy side of things at Safaris and Pallas-Yllastunturi National Park. When in Akaslompolo, make a side trip to see LUVATTUMAA - Levi Ice Gallery in Levi, approximately 1h 05 min away. To find reviews, more things to do, photos, and other tourist information, read our Akaslompolo holiday planner . Madrid, Spain to Akaslompolo is an approximately 11-hour flight. You can also drive. You'll lose 1 hour traveling from Madrid to Akaslompolo due to the time zone difference. Traveling from Madrid in April, expect Akaslompolo to be much colder, temps between 3°C and -4°C. Finish your sightseeing early on the 20th (Sat) so you can drive to Inari. Kick off your visit on the 21st (Sun): examine the collection at Siida, admire all the interesting features of Inari Reindeerfarm, and then identify plant and animal life at Wildlife Areas. Get ready for a full day of sightseeing on the 22nd (Mon): contemplate in the serene atmosphere at Saint Tryphon Pechenga Orthodox Church, get outside with Lake Inari, and then take in the architecture and atmosphere at Pielpajarvi Wilderness Church. To see ratings, reviews, photos, and more tourist information, read our Inari day trip planner. You can drive from Akaslompolo to Inari in 4 hours. Other options are to take a bus; or take a bus. In April in Inari, expect temperatures between 3°C during the day and -6°C at night. 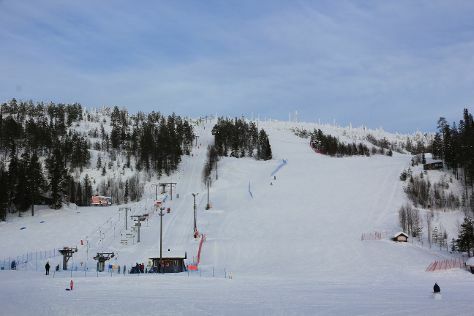 Wrap up your sightseeing on the 22nd (Mon) early enough to travel to Salla. Salla is a municipality of Finland, located in Lapland. 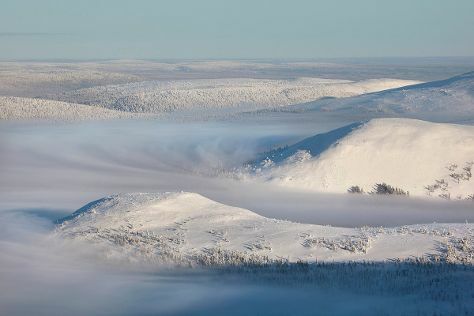 Kick off your visit on the 23rd (Tue): hit the slopes at Salla Ski Resort, then examine the collection at Salla Museum of War & Reconstruction, and then contemplate the long history of Paikanselan Taistelualue. For traveler tips, other places to visit, and more tourist information, you can read our Salla sightseeing planning app . Traveling by car from Inari to Salla takes 4.5 hours. In April, daytime highs in Salla are 3°C, while nighttime lows are -7°C. Finish up your sightseeing early on the 23rd (Tue) so you can travel to Pyhatunturi. Start off your visit on the 24th (Wed): look for all kinds of wild species at Wildlife Areas, then identify plant and animal life at Kopara Reindeer Park, and then admire all the interesting features of Amethyst Mine Lapland. To see traveler tips, ratings, where to stay, and tourist information, refer to the Pyhatunturi trip maker tool . Getting from Salla to Pyhatunturi by car takes about 2 hours. In April, daily temperatures in Pyhatunturi can reach 3°C, while at night they dip to -5°C. Finish your sightseeing early on the 24th (Wed) so you can travel to Rovaniemi. Kick off your visit on the 25th (Thu): tour the pleasant surroundings at Ounasvaaran Hiihtokeskus Oy, get engrossed in the history at Arktikum, and then stroll the grounds of German Soldier s Cemetery. To see maps, traveler tips, ratings, and more tourist information, read Rovaniemi itinerary planner. You can drive from Pyhatunturi to Rovaniemi in 2 hours. In April, plan for daily highs up to 3°C, and evening lows to -3°C. Wrap up your sightseeing by early afternoon on the 26th (Fri) to allow time for travel back home.